Meet the latest winners from your favorite lottery games. Remember, it only takes one ticket to win! 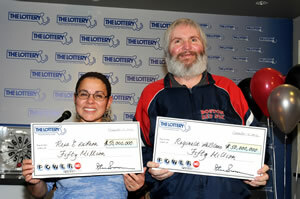 Massachusetts - Yesterday's historic 12/12/12 date proved to be very lucky for two coworkers in Massachusetts after the quick pick ticket they purchased together matched all five numbers plus the Power Ball selected in the Wednesday, December 12, 2012, drawing to win the multi-state game's $50 million jackpot. 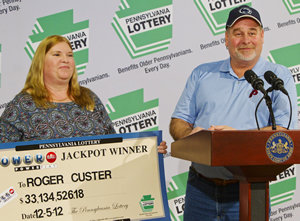 Pennsylvania - Roger Custer, of Levittown, Bucks County today claimed a $33.1 million Powerball™ jackpot from the Dec. 5, 2012 drawing. Lottery Deputy Executive Director for Marketing and Product Development Drew Svitko today presented a ceremonial check for $33,134,526.18 to Custer, holder of the single jackpot-winning ticket from that drawing. 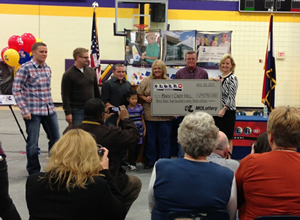 Custer was accompanied by his wife, Linda, and several family members. Missouri - A Dearborn couple made Powerball history by winning half of the game's largest jackpot ever and the state's largest prize. Cindy and Mark Hill said they are in shock after discovering they held one of two tickets that matched all six numbers drawn to win the record Nov. 28 jackpot worth $587.5 million. "I called my husband and told him, 'I think I am having a heart attack,'" Cindy, 51, said. "I think we just won the Lottery!"